Constant fear of terrorism and various security threats have given airports a major headache as they tighten security measures. If you are about to take a flight to visit a loved one or go on your vacation, you will have to pass through airport security. Long lines are not uncommon when going through airport security. If you want to get through airport security quickly then follow some simple guidelines. It is recommended to reach the airport at least two hours before your scheduled departure time. Getting to the airport early is a great way to avoid long lines and unruly passengers. Once you reach the front of the security check, make sure to follow all instructions as you will be thoroughly searched. You need to know what you can carry with you during your flight. The rules are always being updated and you can find the latest information on the internet for assistance. It is important to identify which destinations do not allow liquids or gels so that you don't end up carrying your duty free alcohol and perfumes there. It is recommended to find out which items are allowed when you have connecting flights as well. 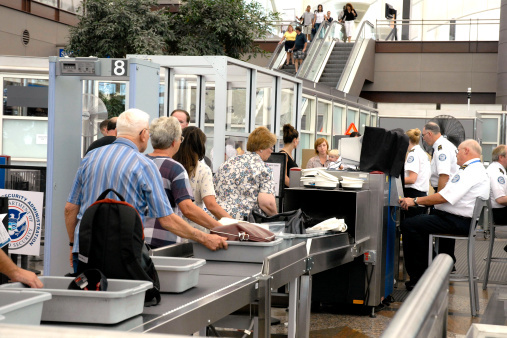 Keep in mind that the fewer number of items you carry, the quicker you will clear the security checks. It is advisable for you to carry aerosols, liquids and gels in your checked luggage. It is important to remember that these items must contain less than 100 ml per container. You should keep your mobile phones in the open when you are travelling. You can put it in your hand or top shirt pocket as this will save you time from having to take your phone out every time you pass through a metal detector. Remember to keep a close eye on your valuables when going through the security check as theft is not uncommon in these areas. You should avoid wearing belts, clothes and jewellery containing metal. In case you do, you will need to take them off when walking through the metal detectors. In addition to this, you need to wear slip-on shoes to make it easier when you are getting searched by a security officer.